Litak, R. K., Barazangi, M., Brew, G., Sawaf, T., Al-Imam, A., and Al-Youssef, W.
The northwest-trending Euphrates graben system is an aborted intracontinental rift of Late Cretaceous age that has subsequently been hidden by Cenozoic burial. Approximately 100 km wide, the system comprises an extensive network of grabens and half grabens extending some 160 km from the Anah Graben in western Iraq to the Palmyride fold belt in central Syria, where it becomes more subdued. The youngest prerift rocks are presently at a maximum depth of about 5 km. Based primarily on interpretation of 1500 km of seismic reflection profiles and data from 35 wells, we mapped a complex network of numerous branching normal and strike-slip faults, generally striking northwest and west-northwest. Both branched and single-strand linear normal faults of generally steep dip, as well as positive and negative flower structures, are manifest on seismic sections. No single rift-bounding fault is observed; instead, a major flexure coupled with minor normal faulting marks the southwestern edge of the basin, with considerable variation along strike. To the northeast, deformation diminishes on the Rawda high near the Iraqi border. The Euphrates graben system likely formed in a transtensional regime, with active rifting primarily restricted to the Senonian and with an estimated maximum extension of about 6 km. 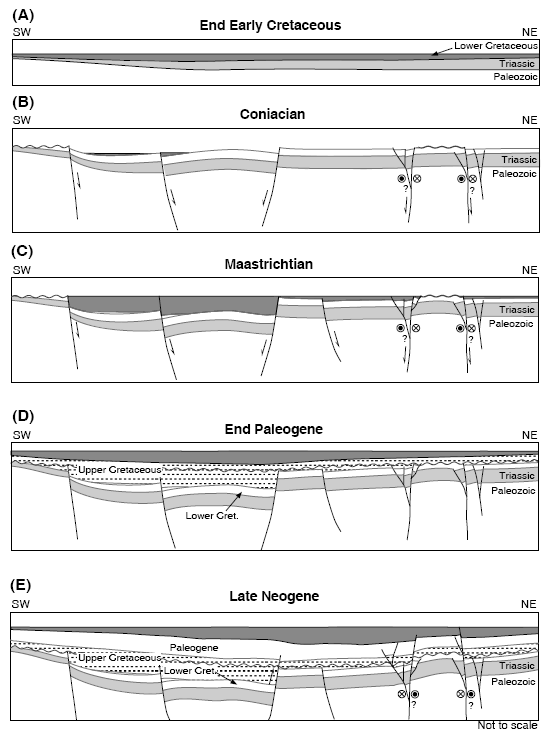 Minor Cenozoic inversion of some structures also is evident. Approximately 30 oil fields have been discovered in the Euphrates graben system since 1984. Recoverable reserves discovered to date reportedly exceed 1 billion barrels of oil and lesser amounts of gas. Light oil is primarily found in Lower Cretaceous sandstone reservoirs juxtaposed by normal faulting against Upper Cretaceous synrift sources and seals. Copyright 1998, AAPG. Reprinted by permission of the AAPG whose permission is required for further use. Figure 5. Structural cross section across the Euphrates graben system based on seismic interpretation constrained by well data. Location shown in Figs. 2 and 4. Figure 14. Series of schematic cross sections illustrating conceptual evolution of the Euphrates graben system. Darkest shaded area represents most recent sedimentation in each case.